This will see little or no coverage by the drive-by media. Cases of measles have reached a 20-year high in several New York counties amid an outbreak that threatens to reach epidemic proportions, experts say. At least 160 people have been infected by the virus, which typically strikes children, in New York and unusual outbreaks have been reported internationally. The worst affected areas so far are Rockland County – where 105 cases have been reported – and an Orthodox Jewish neighborhood in Brooklyn, where at least 55 have been infected. Meanwhile, 25 other states have reported outbreaks, with numbers climbing particularly high in Oregon and Washington. Measles is only preventable by vaccination, and health officials in the worst affected areas are scrambling to speed up shots schedules in the most blighted areas. Among other countries, Israel has seen a recent resurgence in measles. In October, the sudden uptick in cases in New York City was linked to an unvaccinated traveler from Israel. Though the details of the Oregon and Washington cases have not been released as publicly, the Washington outbreak was traced to an unvaccinated child who had traveled to the state from another country. The measles vaccine was introduced in the US in 1963 and, ever since, the virus has been a minimal threat. But among those not inoculated against it, measles is among the most contagious diseases in the world and can be life-threatening. Measles often begins with a fever, sore throat, runny nose and cough but there are a few tell-tale signs of the infection. Eventually, a rash composed of large red blotches materializes, first on the face, spreading until it eventually covers the whole body. As the infection worsens, complications can include diarrhea, lung infections and brain swelling. Some one in 20 children that contract measles develop pneumonia, making it highly dangerous to young kids. Fortunately, the vast majority of children in the US and developed nations are protected against the virus by the combined measles mumps and rubella vaccine (MMR). Babies are supposed to get the shot in two doses. The first dose should be given between the first 12 and 15 months of life, and the second between ages four and six, as per the Centers for Disease Control and Prevention’s (CDC) recommendations. As of May 2017, the CDC estimated that about 91 percent of children under three had received at least their first dose of the MMR shot. In recent years, however, there has been a growing – though largely unfounded – movement against vaccinations. Some populations have a longer history of reticence against shots. Some members of both the Amish and Orthodox Jewish faiths believe that their religions’ edicts, histories or some combinations of the two prohibit them from getting their children vaccinated. One of the arguments made by Orthodox Jews is that if a dangerous disease becomes rare – thanks to high rates of vaccination among the general population, typically – then getting shots for their children may do more ‘harm’ than good and thus be against Orthodox Jewish law. But in 2013, for example, a measles outbreak struck the neighborhood of Williamsburg in New York City’s Brooklyn borough. The 58 infections were contained entirely in the Orthodox Jewish community there. The outbreaks that have emerged in recent months have followed a similar pattern. One unvaccinated child from Brooklyn reportedly traveled to Israel, contracted the virus, then returned to its home in New York and spread the infection to other unvaccinated kids in the community. In Oregon, there has been a moderate influx of Orthodox Jews (particularly in Portland). However, it is less clear what is fueling the outbreaks there or in Washington. There has been some increase in the number of children not getting vaccines, but the majority of the population in both states is still protected. Rockland County, New York, is home to a number of all-Orthodox villages and the population of Orthodox Jews has been growing rapidly throughout the area in recent years. John Lyon, spokesperson for the Rockland County Health Department said that the outbreak has struck unvaccinated communities there. 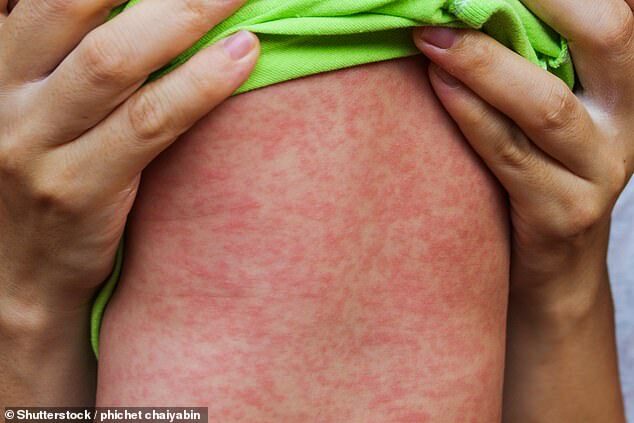 ‘We’re making some progress, but this is one of the most contagious diseases out there in unvaccinated populations,’ he told Daily Mail Online. So far, the county has given over 11,000 vaccinations to children there, but is still struggling to contain the virus’s rapid spread.